After the rest day in Le Vigan it was time to enter the Cevennes National Park area. The first task was to climb to the top of Mont Aigoual. A few kilometers out of Le Vigan was the pretty, creekside village of Aulas. With Le Vigan so close, Aulas was very quiet since everyone just utilized the shops and services in Le Vigan. The approach to the village made for some excellent photography. The path followed roads and trails in a gradual climb, much of which were heavily forested. I passed several people during these early kilometers, a trend that would only increase as I neared the mountain and the heart of the park. Further up was the village of L’Esperou, which had more chalets than stone houses. L’Esperou is a ski town in winter, with only the cafes open this time of year. However, the weather was changing to resemble winter. It was pleasant and sunny when I left Le Vigan, and it was cold and overcast by the time I hit L’Esperou. Stopping for a hot coffee was a nice feeling, but it had me doubting the conditions heading into the last 7km towards the summit. After walking through the ski areas, I arrived at the summit. By that time the wind was screaming and there were a few raindrops that were supercooled by the wind. I was freezing, but the silver lining was that the clouds were high enough to still have good views in 360°, so I stayed long enough to take some photos before I couldn’t take it anymore. I had originally planned on camping near the summit, but there was no way that was going to work, so I continued on for a few more kilometers to get down and out of the worst of the weather. I camped next to the road. It was cold and windy, but the rain held off. After a cold and breezy night, I followed creekside roads through the forest. They eventually left the forest and presented a steady climb through alpine ridges with amazing views over the countryside houses below. The wind was again howling and some rain spirts were around, leading to rainbows reaching up from the valley floor. The views were great, but I soon tired of the wind and raindrops. The roads continued to span the range tops where there were few trees. I expected the roads to drop down into the valley, but they never did. After a few more road changes I arrived in Barre des Cevennes, a linear village balanced on the hillside under a rocky outcrop. It was an excellent entrance to the village, providing some nice side-on views. I hung around in the village for a while so that I could buy groceries and have my habit fulfilling coffee before going to a nearby campground for the night. It was very cold with extremely high winds and showers that night. I was struggling to keep warm and my poor tent took a beating. In the morning before setting off, there was a lovely family preparing their donkey to continue their pack animal trek. This was the third time I had come across a young family making a trek together with a donkey, so this seems to be quite popular in France. After a lot of forest walking, the path dipped down through a river valley before climbing through the hamlet of Cassagnas and into the highlands with its characteristic purple flowers. The day was windy and cool, and a few scattered showers turned into some steady rains. The poncho was needed to keep the pack dry. After many dirt roads in the forest, the clouds parted and the sun took over. I ditched the poncho in hopes that the rain was finally over, but jinxed myself. Once I had descended into the valley about 1km from the village of Le Pont de Montvert, it started pouring and the temperature plummeted. That made arrival, into an amazingly beautiful village, a bit of a dismal challenge. I froze while sitting at a cafe waiting for the rain to break, and it finally broke long enough to go shopping and get my tent set up at the local campground. While the rain had passed, the ground was very wet and the night was cold. Knowing that the following day was supposed to be a bit warmer and sunny, I was eager to get going and put the winter-like weather behind. Walking through the rugged highlands was fantastic. 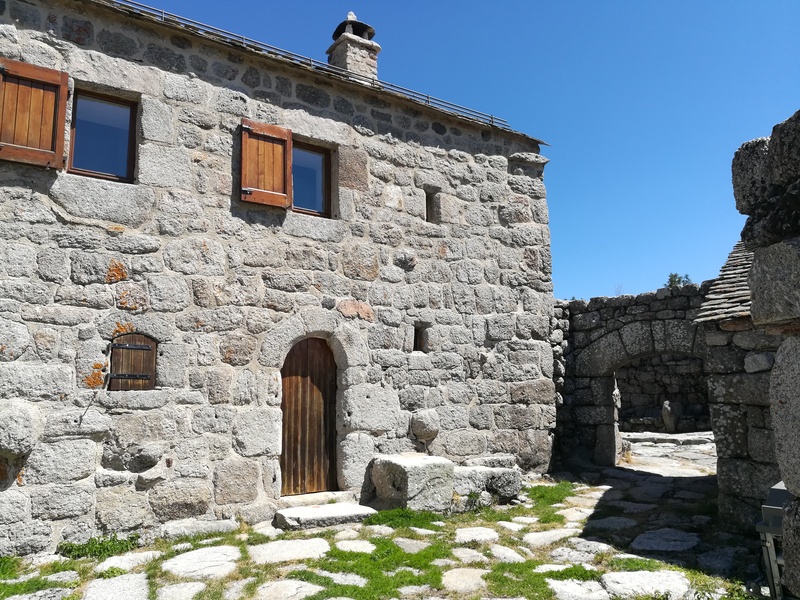 There were great views of the rocky, purple flower covered hills, and the landscape was dotted with amazing stone hamlets like Belecoste and Mas de la Barque. It was like stepping back in time. This area provided a truly enjoyable walking experience. I spotted at least three different types of birds of prey hunting in the grassy areas as well. This area ranks near the top of the list for experiences thus far on the trip. Once the grassy highland area had passed, the forest again appeared for the gradual descent into the valley. There were some nice pieces of forest trail, but also some massively overgrown trail that slowed me down. The purple flowers again lined the road on the final stretch to Villefort. Villefort was a nice town, but after Barre des Cevennes, Le Pont de Montvert, and the highland hamlets, it was a bit plain in comparison and hard to get excited about. As with the previous few villages, I ran errands and then retired to my tent at the municipal campground.